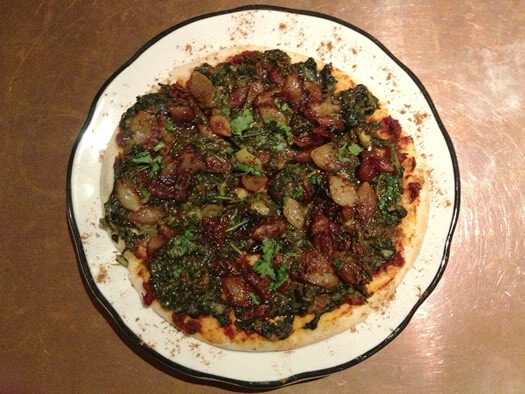 Specifically, my heart belongs to the flatbread topped with spinach, preserved lemons and green olives. That's what the menu lists as the toppings anyway, but in reality it also include caramelized baby onions and a tomato jam. To get this classic flavor from Morocco, lemons are cleaned, rubbed with salt, and packed in a lemon juice brine for over a month. Then the rind is removed from its fruit (the rind is the part that's eaten), sliced thin, and added to all manners of food ranging from grilled fish to long simmered stews. These may not be for the unadventurous. There is nothing reserved about a preserved lemon. You bite into it and it explodes with a bright, acidic pungency that's laced with a bit of funk and an underlying bitterness. Paired with salty and fruity green olives, this is a one-two punch of big, bold flavors. The soft and comforting sauteed spinach provides a silky base for these other elements to strut their stuff, but their pungency is ultimately balanced by the sweetness of caramelized onions. And all of this is yours for merely $6. The catch is that you have to make it into the restaurant on one of the days they are open for lunch. That would be Tuesday through Friday from 11:30 am to 2 pm. And at lunch this flatbread is the only dish that comes with preserved lemons. 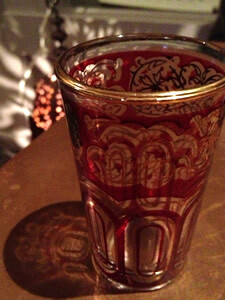 At night they are available in a chicken tagine, again with their usual partner in crime the green olive, for $16. But don't let all this intensity scare you away from this cozy little restaurant. 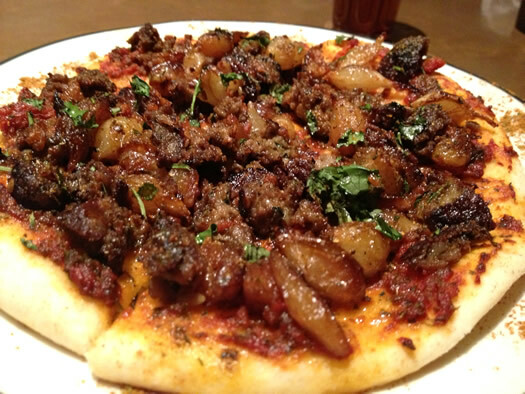 Because there is also a lamb flatbread with tomato jam, caramelized baby onions, and cilantro that's dynamite for $7. It is generously scattered with bite-sized pieces of well-seasoned and tender lamb strips with nary a preserved lemon or green olive in sight. A lamb kati roll is effectively a wrap of grilled ground lamb kabob inside a thin bread that's crisp on the outside and soft and doughy on the inside. It too is deeply seasoned and remarkably flavorful. A simple preparation of meat and bread should hopefully be an accessible point of entry for the less adventurous. This rolled sandwich is not large, but it's full of meat and only $6. All of the food pairs beautifully with small sips of complimentary hot mint tea that's served in diminutive decorative glasses. This place just oozes warmth and hospitality. Unless of course you are sitting by one of the tables by the door, or at the counter, when the door is opened during the winter. But if you can grab one of the few tables upstairs in the small, warmly lit dining area, you'll be better protected from the elements and able to enjoy your flatbread in peace. I love this restaurant. Seriously - if there is one place to try in the next few months, this is the one. 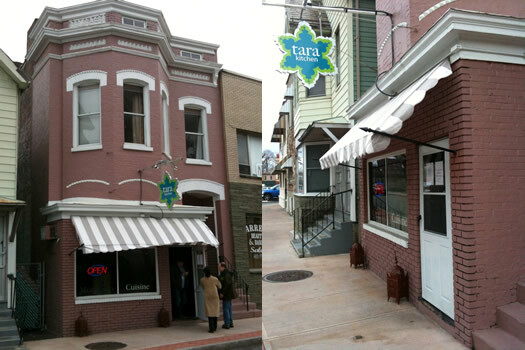 I've had lunch here and this place is incredible - simple, warm, homey dishes that make me want to visit Morocco! I read this with a smile, knowing The Profussor was also reading it and stewing the entire time about the headline. "I SPECIFICALLY said it is NOT a pizza." I haven't been over to TARA in a while, time I go back! Thanks for the heads-up on this deliciousness. I haven't made preserved lemons yet this year, but I do have lots of tomato jam in the larder. Maybe I'll try making this at home. Also - have you made preserved lemons before? I've never done more than packed them in a ton of salt, and they kind of "self-brine." I'd love more direction on the brine you pour over them. Not only the food is delicious but the hospitality given by Aneesa and Muntasim is very warm...Keep smiling Muntasim!